Today, we are sharing an example of community collaboration, emphasizing a practical application of data to produce real-world solutions to policy issues. Mid-Iowa Community Action (MICA), located in Grinnell, IA, partnered with DASIL to evaluate the quality of its food pantry services and determine ways to promote healthier eating among the families it serves. This partnership allows for the investigation of data, providing the necessary concrete evidence to drive future changes in MICA’s food box policy. Seth hopes that this will inaugurate a shift to more data-driven decision-making at MICA. Obesity and Type II Diabetes differentially affect the lower-income Americans who are the clients of MICA. This has been largely attributed to financial constraints leaving families with no choice but purchasing the most inexpensive food they can, which is frequently less nutritional. Thus the food pantry is potentially an important potential part of the solution. To learn more about the influence of income on diabetes rates, take a look at this study by the Center for Disease Control and Prevention or explore DASIL’s interactive visualization on factors correlating with diabetes. Food boxes are distributed monthly to the families MICA serves, providing varying amounts of food based on family size. After a few weeks at MICA, Grinnell Corps Fellow Seth Howard approached his director about conducting a survey to evaluate the need for changes in the food boxes. The goal of the survey was twofold: to assess satisfaction with MICA services, as it had been years since the food services had been adequately evaluated, and to ascertain the demand for healthier foods, different foods, nutritional information, and cooking tips. Seth surveyed every individual who utilized the food pantry in the month of July using a questionnaire that could be returned anonymously to a submission box. 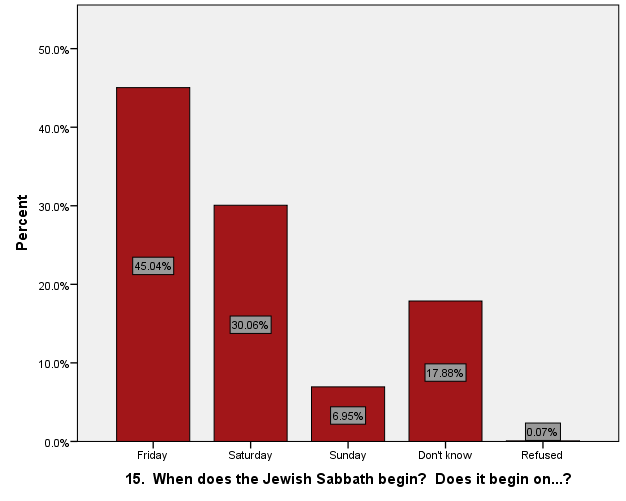 A total of 195 household took the survey, giving a response rate of 78.9% of the 247 households served in that month. Using a 5-point Likert scale (1-Strongly Negative, 2- Somewhat Negative, 3-Neutral, 4- Somewhat Positive, 5- Strongly Positive), survey takers responded to the frequency with which they use common food box items, as well as answering some questions about what they’d like to see in future food boxes. 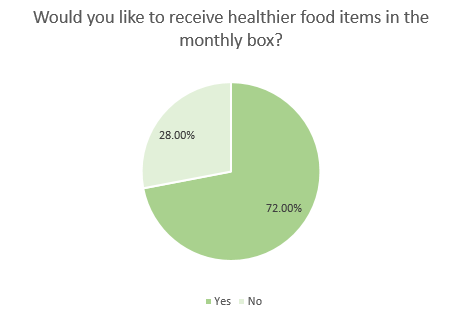 As the graphic below shows, overall, MICA households using the food pantry wanted to see healthier items despite being generally satisfied with the food boxes (only 6.15% reported strong or slight dissatisfaction). Providing even better, healthier options will increase satisfaction and drastically boost use of food box contents. 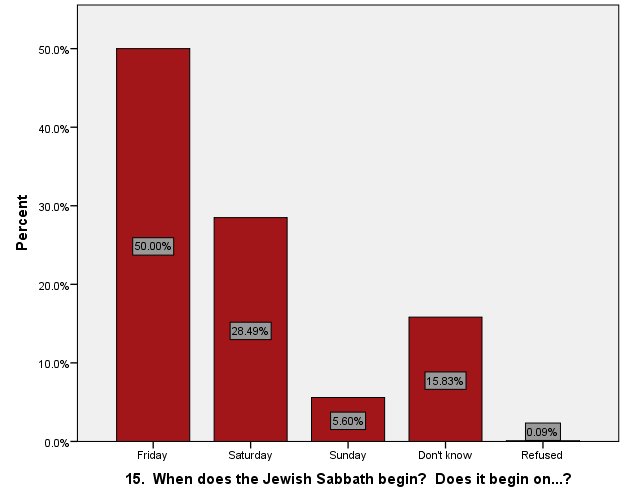 No weighting variable: the estimate is that about 50% of the population knows that the Jewish Sabbath starts on Friday. Appropriately weighted data: The estimate changes by about 5 percentage points, suggesting that only 45% of the population knows the correct start time. Full disclosure: I approach this topic simultaneously from the perspective of a social scientist and as the instructor of a traditional introductory statistics class for over twenty years. I am, thus, myself part of the problem. While I am mainly following the dictates of some of the most popular text books, it is fully within my power to diverge from the book. When I do not do so, it is really my own fault—a sheep following the sheep dogs. The views and opinions expressed on individual web pages are strictly those of their authors and are not official statements of Grinnell College. Copyright Statement.